East and West Antarctica are separated by the Transantarctic Mountains (TAM), a 3500 km long crustal discontinuity that cuts across the whole continent. The highest elevation of the mountain range is 4500 km (Morelli and Danesi, 1994). The Cenozoic TAM are a relatively unique feature of Antarctica since they are the world’s largest example of a non-contractional mountain belt, with no subduction or contraction involved in their uplift. They are therefore characterized by a lack of folding or thrust faulting (ten Brink et al., 1997). To the west of the TAM is the Ross Embayment, a large submerged extensional region of continental crust, and to the east is the Wilkes subglacial basin, a 200-600 km wide depression parallel to the TAM (ten Brink et al., 1997). Embayment, modified from Stern and ten Brink (1989). The TAM consist of a Proterozoic to early Paleozoic basement, overlain by an unconformable erosion surface separating it from Devonian to Triassic glacial, alluvial, and shallow marine sediments. Both the basement and sedimentary layer are intruded by Jurassic dolerite (Fitzgerald, 2002). The TAM have a long history of tectonic activity. Rifting began in the Neoproterozoic, followed by mid-late Cambrian transpression and subduction-related magmatism, and then rifting again during the Jurassic. Therefore, the TAM have become a lithospheric boundary marking a very large contrast in crustal thickness, with the thinner crust of the West Antarctic Rift System to the west of the mountain range. Erosion has been occurring since the early Cenozoic at a rate of about 100 m/My, which is relatively slow. For the first 10-15 My, exhumation probably occurred at twice this rate and then slowed as the climate cooled and glaciation began (Fitzgerald, 2002). One hypothesis is that the TAM are an example of rift-shoulder uplift, explained by lithospheric flexuring on opposite sides of a normal fault system which divides East and West Antarctica, and which caused uplift of the TAM and subsidence of the Ross Embayment. It’s postulated that very low density mantle formed to compensate for the thin crust of the Ross Embayment, and this mantle material extended 50-70 km underneath the East continent, creating a sub-lithospheric load which caused the flexuring (Bott and Stern, 1992). Fig: A drawing showing the lithosphere and upper mantle of East and West Antarctica, with the West Antarctic low density mantle extending below the eastern side. From Bott and Stern (1992). A related hypothesis is that re-organization of the Antarctic plate during the Cenozoic may have caused transtentional motion between East and West Antarctica, which were already loaded by thermal buoyancy of the mantle due to previous extension, breaking the plate at the mountain front and triggering flexural uplift of the edge of East Antarctica. This uplift formed the mountain range. The Wilkes subglacial basin would be considered the “outer low” caused by this flexural uplift (ten Brink et al., 1997). Alternatively, it is hypothesized that the West Antarctic Rift System was a high-elevation plateau with very thick crust that underwent extension due to plateau collapse. This crust was hot and initiated rifting and subsidence in the middle of the plateau, while the cooler edge retained its greater thickness and was elevated. After undergoing erosion, this plateau edge became today’s TAM (Bialas et al., 2007). Fig: Cross-section of the plateau collapse model, modified from Bialas et al. (2007). Bialas, R. W., Buck, W. R., Studinger, M., Fitzgerald, P. G., 2007. Plateau collapse model for the Transantarctic Mountains–West Antarctic Rift System: insights from numerical experiments. Geology, 35 (8), 687-690. Bott, M. H. P., Stern, T. A., 1992. Finite element analysis of Transantarctic Mountain uplift and coeval subsidence in the Ross Embayment. Tectonophysics, 201 (3), 341-356. Fitzgerald, P., 2002. Tectonics and landscape evolution of the Antarctic plate since the breakup of Gondwana, with an emphasis on the West Antarctic Rift System and the Transantarctic Mountains. Royal Society of New Zealand Bulletin 35, 453-469. Morelli, A., Danesi, S., 2004. Seismological imaging of the Antarctic continental lithosphere: a review. Global and planetary change, 42 (1), 155-165. Stern, T. A., ten Brink, U.S., 1989. Flexural uplift of the Transantarctic Mountains. Journal of Geophysical Research, 94 (B8), 10315-10.
ten Brink, U.S., Hackney, R.I., Bannister, S., Stern, T.A., Makovsky, Y., 1997. 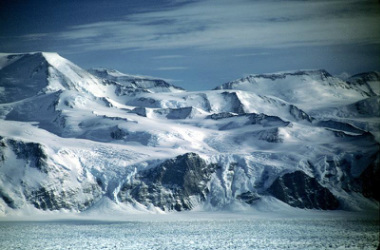 Uplift of the Transantarctic Mountains and the bedrock beneath the East Antarctic ice sheet. Journal of Geophysical Research, 102 (B12), 27603-27.